Satisfy your sweet tooth and reap the health benefits. Yes, you read correctly. "Sweet tooth" and "health benefits" are in the same sentence. I am an extreme chocoholic by nature, so denying myself of this daily fix is torture (and unnecessary). When I tried to cut it out from my diet, I overate other foods only to continue craving chocolate afterwards. #ChocoholicProblems. Make sure to buy the raw, unrefined honey which contains minerals, vitamins and enzymes not found in processed honey (chances are you have processed honey in your pantry). The glycemic index varies depending on the type of honey, but regardless of containing simple sugars, honey is not the same as white sugar or artificial sugars. It actually helps your body regulate blood sugar levels. Honey has shown to increase athletic performance by maintaining glycogen levels and improving recovery time in comparison to other sweeteners. Brazil nuts are one of the highest dietary sources of selenium, a trace mineral shown to prevent certain cancers. Most people are selenium deficient due to diets high in processed foods. Selenium deficiency has shown to induce hypothyroidism among other risks. Good news, you can get your daily recommendation of selenium by eating four Brazil nuts per day. Just four! FUN FACT: By eating your nuts with coconut oil, you are absorbing more available nutrients in the nuts than by eating the nuts by themselves. Here's why. In a baking sheet pan, add the raw nuts and coconut shreds. Dry roast at 250 degrees for 20 minutes. Dry roasting--verses oil roasting--tends to preserve the nuts micronutrients (vitamins, minerals and enzymes). Once the pan is not going to burn off your fingers, add 2 tbsp coconut oil. You may need to nuke in the microwave if the nuts aren't warm enough to melt the oil on their own. Then, add the raw honey, Stevia and cinnamon. The amounts can vary so do some taste tests along the way to adjust accordingly. 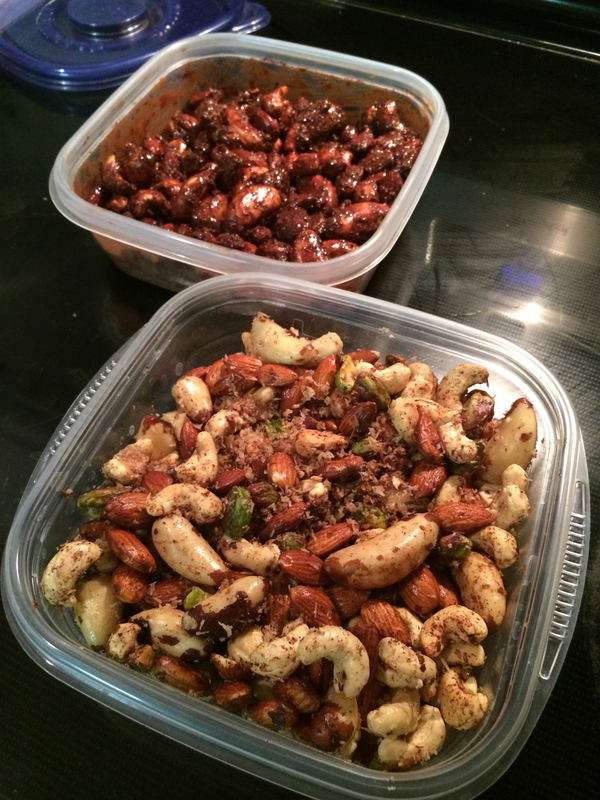 Toss all ingredients and divide the nuts into three Tupperware containers. In one container, I keep as is. In the second container, I toss in cacao nibs (Gogi Berries could be a nice addition in this one too). In the third container, I add one additional tbsp of coconut oil, about one to two tablespoons of cacao powder and a little more Stevia. Store in fridge. The coconut will harden, creating a more clustered texture. I have noticed the flavor of the nut clusters with cacao powder develop after at least 10 to 15 minutes in the fridge. They are also a little messy before refrigeration, so I highly recommend keeping them in the fridge before eating. Add more nut variety: pistachio, walnut, pecan, peanuts etc. Add in unsweetened, freeze-dried fruit (ingredients listed should only be the fruit, NO sugars or preservatives): Gogi berries, dried blueberries, dried banana slices etc. To spice it up: add ground nutmeg, cloves, ginger and all spice to the mix! Eat as is (it's good enough to eat like that). I generally pair an ounce with a protein shake before bed. The fat content in the nuts binds with the protein in the shake, slowing down the digestion (similar to casein protein shakes). Add to cultured yogurt with additional stevia or raw honey and cinnamon. Pair with a piece of fruit for a healthy snack in between meals. Crush up in a food processor and eat it like cereal with a 1/2 cup of unsweetened coconut or vanilla almond milk. Dr. Mercola: "Coconut Oil: This Cooking Oil Is A Powerful Virus-Destroyer and Antioxidant..."; "Countless Uses for Coconut Oil--The Simple, the Strange and the Downright Odd" and "Which Oil Will Help You Absorb Nutrients Better?"